Have had my plant for about 3 years and have had only 1 bloom each year. 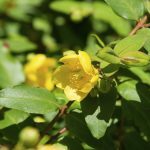 How to get St. John's wort plant to bloom? If the plant seems happy and healthy but just not flowering it may be to much nitrogen in your soil.